Run on Less proves available techs could unlock $24 billion for N.A. trucking. 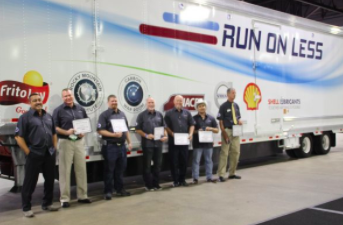 Trucking Efficiency, Shell, and PepsiCo set the wheels in motion for a first-of-its-kind cross-country roadshow to showcase fuel efficiency in long-haul trucking. April 6, 2017, New York—Shell, PepsiCo, the North American Council for Freight Efficiency (NACFE), and Carbon War Room (CWR) today announced Run on Less, a first-of-its-kind cross-country roadshow to showcase advancements in fuel efficiency. The event will take place in September 2017. Run on Less will demonstrate how Class 8 trucks can use different technologies to achieve the best fuel economy possible. The three-week experience will kick off from multiple locations across the United States and culminate at the North American Commercial Vehicle (NACV) inaugural show in Atlanta, taking place September 24 to 28, 2017. Run on Less will be led by NACFE and CWR’s Trucking Efficiency Operation, with Shell and PepsiCo as the title sponsors. Run on Less will feature six to ten Class 8 trucks, using current, commercially available technologies that will haul real freight around the country. The trucks will be equipped with different efficiency technologies, and drivers will demonstrate how to achieve the best fuel economy in today’s highway tractors. With a goal of achieving 9.0 MPG or more, the technologies fitted to the trucks will range from 6x2s and automated transmissions to aerodynamics and other technologies that assist with improved freight efficiency. Driver progress, as well as the dollars and carbon emissions saved, will be tracked and reported in real time throughout Run on Less via a live online site. The inaugural NACV Show 2017 will take place at the Georgia World Congress Center in Atlanta, and is expected to see 10,000 trade visitors and 400 exhibitors. Well-known manufacturers of commercial and specialty vehicles, as well as producers of parts and components, will present their wide range of products. More details about Run on Less will be announced in coming months. During April, event organizers will be accepting fleet applications to participate in the Run. Sponsorship opportunities will remain open until June 1. For more information, please contact Mike Roeth at mike.roeth@nacfe.org or visit www.runonless.com.